Sonlight Instructor's Guides, developed from years of experience and customer feedback, give you all the vital resources necessary to your homeschooling success... and then some. Maybe you're investigating homeschooling for the very first time. Or maybe you've homeschooled for a few years already. Either way — whether you're new to homeschooling or still looking for the "right" curriculum — you'll be surprised and delighted by the unbelievable amount of support you'll get in just one of Sonlight's Instructor's Guides. Imagine going to bed each night without worrying about what you were going to teach in the morning. Imagine not having to create your own schedules or come up with questions to test your students' comprehension. Now, imagine having in your possession a guide that will tell you exactly what to do and when to do it; a guide that contains comprehension questions and activity sheets for your student; a guide that includes notes written directly to you... to help you teach more effectively. Wouldn't that be wonderful: to not have to worry about what you are doing each day, but to simply do it? With Sonlight's Instructor's Guides, you won't have to worry about scheduling, comprehension questions, activity sheets. None of it. Because we've already done it for you. You wake up refreshed from a good night's sleep. After sharing a casual breakfast with your family, you grab your Instructor's Guide, and open to, say, Week 12. It's Friday, so you look at the next day column. You immediately see that you and your children will be reading Luke 20:27-47 in your Bible, plus pages 131-133 in The Discoverer's Bible for Young Readers. You will also be reading page 56 in the American Indian Prayer Guide; pages 20-23 in The Landmark History of the American People; chapter 8 in The Matchlock Gun; pages 23-31 in Johnny Tremain; and pages 66-69 in Classic Poetry. After the Bible reading and prayer — not only for your own family, but for the Iroquois peoples of upstate New York — you begin reading. All of your kids are gathered around you on the couch. They're mesmerized as history comes alive before them in the award-winning words of the authors whose books you are reading.... After twelve weeks, you're hardly surprised when you ask them questions about the stories you're reading and they're able to discuss them intelligently. You know they're learning... and you're all having fun. But perhaps the most gratifying moment each day occurs when you close each book and your kids beg you: "Mom, pleeeaaase! Can't you read just one more chapter?" I can imagine what you're thinking: this would never occur in your family. And you may be right. But what I've just described is far more common than you think. "I am so thankful for the Instructor's Guides. They are invaluable, and I can't imagine homeschooling without them. They say that the first year of homeschooling is usually a challenging one. I haven't found this to be the case, and I know it's because we're using Sonlight!" "The Instructor's Guide has made homeschooling a blessing rather than the burden it was before when I was spending 4-6 hours per week scheduling and studying in order to teach." So what's so great about a Sonlight Instructor's Guide? The three sections that make it up: Schedules & Notes; Student Study Guides & Activity Sheets; and Parent Answer Keys. These will be your personal guides as you embark on the homeschooling journey. Each Instructor's Guide includes complete 180-day schedules. All reading assignments, activities, experiments, grammar lessons — everything — is scheduled on a day-by-day basis. The only thing you have to do each day is review what's already been scheduled and do it! The Instructor's Guide schedules save you hours of time and frustration. Literally. Hours every week. They provide you with the "master plan" that minimizes the time you must spend preparing lessons while maximizing the time you have for face-to-face interaction with your kids. Do you realize some classroom teachers spend up to 4 or 5 years teaching a single grade before they feel comfortable that they have created stable lesson plans they can use year after year with little modification? That's a long time! In high school, it's even more shocking.... It may take a teacher up to 4 or 5 years to create good, stable lesson plans for a single subject within a single grade! What that really means is that it could take as many as 15 years of full-time teaching to create a complete set of quality lesson plans for History, Language Arts, and Science at the high school level. But you don't have to invest that time. All that work has been done for you in the complete, detailed schedules we include in every one of our Instructor's Guides. You'll also find that we periodically include notes to the instructor within the schedule pages. These notes are intended to give you creative extracurricular ideas that tie into what your kids are learning; counter-arguments — "the other side of the story," as it were — to balance lopsided opinions you may encounter in your reading; fodder for dealing with questions your children may ask; and tips that may help you teach your children more effectively. While the schedule and notes are enormously helpful, they make up only one section of the Sonlight Instructor's Guides. At least two more sections — equal in value to the schedule and notes — go into every Guide. The Student Study Guides are your lifeline in the level A-H History / Bible / Literature programs. They contain notes, as necessary, about the History books and Read-Alouds and Readers. Further, the History guides also include learning objectives, while all the Guides include comprehension questions — with answers — so you can be sure your children are really understanding what they're reading. Study Guides for some books are as brief as one page. Others are longer. For instance, the History / Bible / Literature D Study Guide for The Landmark History of the American People includes 18 pages of notes and questions... while the Level-100 Study Guide for the A History of US series includes nearly 300 pages! The Study Guides allow you to speak knowledgeably about the books your child is reading without actually having to read them. Indeed, if you have more than one child and they are studying different year's curricula, these Study Guides could provide the only means you have to keep ahead of them. You'll most likely want to read many of the books your students read. But if you can't get to all of them, you'll have a resource you can rely on. Same thing with the comprehension questions. You can evaluate your student's comprehension and retention without having to read the books. 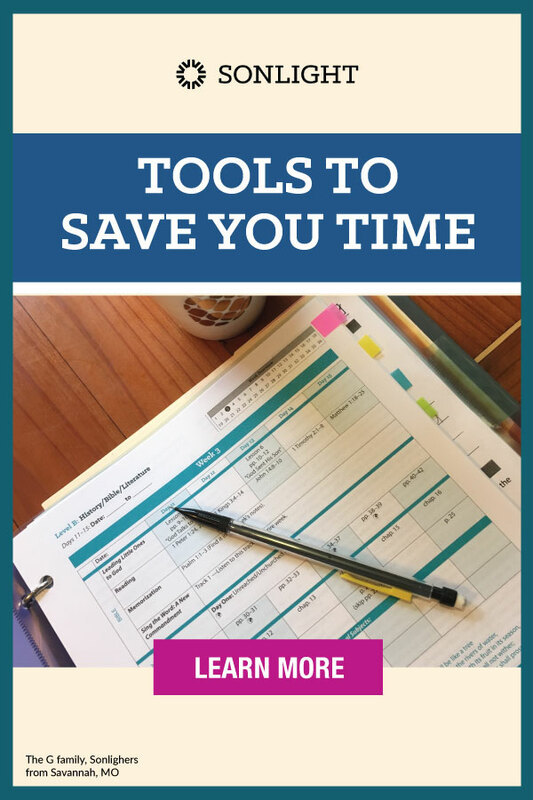 Trust me — it's a lifesaver to have these resources at your fingertips. Another part you'll love about the Study Guides are the Cultural Literacy and Nature Science Questions. These questions encourage your children to dig deeper and indulge their curiosity. For instance, there are fun questions like, "What is a potpie?" There are practical questions like, "What is the correct treatment for a fever?" And there are historically significant questions that you'd probably never ask yet are very interesting nonetheless... like "What characteristics of pine knots would make them useful for starting fires?" Our hope is that questions like these will pique your children's curiosity and inspire you and them to do some research: to crack open the dictionary, pick up the encyclopedia, or use online search tools to find answers to the questions that naturally arise from reading a great historical novel. Of course, we provide answers for you in the Study Guides so you can confirm the answers your children uncover and congratulate them for their information sleuthing. We want your children to learn, but, even more, we want them to have fun learning. And we want them to learn how to learn — how to find information and solve problems — so they'll be well equipped for adulthood. Activity Sheets are included in both the Language Arts (K-7) and Science Instructor's Guides (K-6): one set for your students to complete on their own, another for you, with all of the correct answers highlighted, circled, or typed into the blank spaces. The Language Arts Activity Sheets are especially powerful because they are based on excerpts from the books your student is reading in other areas. By continued exposure to familiar passages, your children retain more than they would otherwise. The Science Activity Sheets are user friendly, and very attractive: they've got hundreds of illustrations, charts, and pictures, all of which serve to make the sheets more interesting and useful and help your kids remember even more. Besides the Student Activity Sheets, you also get a complete Parent Answer Key in every Instructor's Guide. In the History / Bible / Literature guide, the answers are woven into the Study Guides because you'll be interacting with your children orally to make sure they understand the concepts and ideas you've explored together. But, as I mentioned above, the Language Arts and Science Guides contain two sets of Student Activity Sheets. One set is for the student to mark up... the other is the Parent Answer Key. Normally, you would expect to find each one of the three pieces we include in our Instructor's Guides to be sold separately. And each piece — the Schedule, the Study Guides/Activity Sheets, and the Parent Answer Keys — would cost you $20 to $30 or more. Put them together, and you'd be looking at Guide books costing $60, $90, even $100 or more. Each. But, with the exception of five very thick guides at the junior high and high school levels, we have held the prices of our History / Bible / Literature Instructor's Guides to a retail price of $56.50. Language Arts Instructor's Guides cost no more than $40.00. And you can get a copy of our Science Instructor's Guides for the reasonable price of only $33.50 or less. And get this: you'll save an additional 10% off these already low prices if you purchase your Guide within an All-Subjects Package or History / Bible / Literature program. As soon as you have the opportunity to use our Instructor's Guides, I think you'll agree that they're worth every penny you pay for them. If you're new to Sonlight, I'd recommend taking a look at how to choose an All-Subjects Package. Or, if you're thinking you'd rather purchase just a few different components that Sonlight offers, please read the article "How to Choose the Right Materials for Your Child". You can teach your children with poise and confidence. You don't have to be "stressed out" about homeschooling. So I invite you to begin your journey today.